It’s not particulary scary for a horror movie but it does have some strong imagery and violence. The horror elements are character oriented and Sandra Bullocks main character has a solid arc. Unfortunately it doesn’t really hit you that hard by the end.The cast is solid and the plot is fine for the most part, but kind of misses a lot of explaining about what is actually happening. I was left with several questions regarding the creatures by the end, same goes for a few turns in the story. 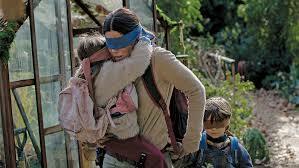 The movie have a good script and Bird Box in my opinion is a good movie, i know there are many people that don’t like the movie but when Sandra Bullock play the movie in my opinion is good.There are no visible monsters, no explanation why they arrived, no explanation how they do stuff or why people goes mental, no explanation why some people can survive the monsters, no explanation why the survivors are happy.People are also going insane when looking, even when the monsters aren’t there.